If you ever want to be confused, try searching for “corporate development careers” online. Some people think corporate development is a great, underrated alternative to private equity and investment banking, while others think it’s a “slow glide to death” as you deal with managers straight out of Dilbert who enjoy making terrible decisions. 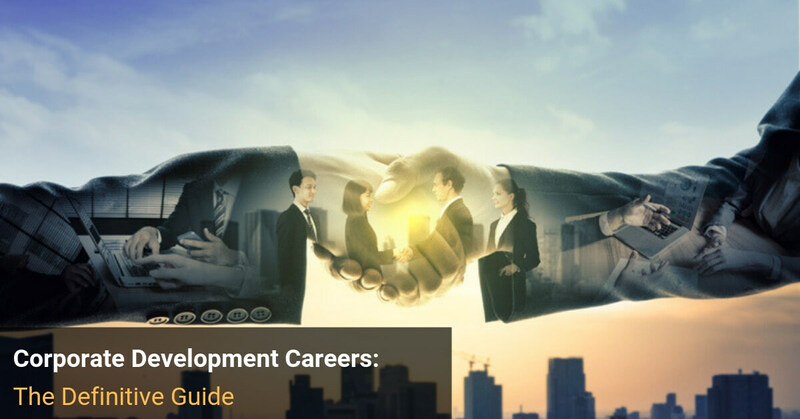 Some argue that corporate development gives you solid exit opportunities, while others argue that it’s overrated and not an ideal place to start your career. And some believe that corporate development offers a laid-back environment with good hours and solid compensation, while others argue that professionals in this industry are underpaid for what they do. In case you missed the first article on corporate development recruiting, the corporate development ( “Corp Dev” or “CD”) team focuses on acquisitions, divestitures, joint venture (JV) deals, and partnerships internally at a company. Professionals in corporate development careers also spend time doing industry research and mapping out markets, and some teams also spend time on post-deal integration. If you’re in corporate development at a large company (i.e., Fortune 100), you will spend most of your time on M&A deals and you’ll do less sourcing and “random” work. If you’re at a smaller company, you’ll often spend more time on sourcing and tasks that would fall under “business development” or “corporate strategy” at a bigger company. Corporate development is a good option if you want to work on deals, stick with one company over the long term, and get a better lifestyle and hours than in IB/PE – at the cost of lower pay and slower advancement. Whether or not you have any active deals, and how close they are to closing. The company you’re at and how active it is with acquisitions, divestitures, and partnerships. For example, if you’re at a large company and you’re near the finish line on a $2 billion acquisition, you will be working around the clock – similar to investment banking hours – to close the deal, verify the final terms, and handle last-minute problems. On the other hand, if there are no live deals, your day might consist of internal meetings in the morning, followed by industry research and reviewing marketing materials for potential target companies sent by the bankers representing them. You do more of this at smaller companies and less at larger companies since bankers constantly come in to present deals. This one refers to everything required to run an M&A or JV deal from start to finish, excluding the financial modeling and valuation. Tasks include conducting due diligence on target companies, reviewing the definitive agreement, and keeping track of the data room and other potential buyers. For JV deals, tasks might include analyzing the potential partner’s customer and supplier relationships and agreements. This is what it sounds like: creating revenue, expense, and cash flow projections for companies, valuing them, and then using that information to frame your offers. It’s similar to what you do in investment banking, but you go into more granular detail here because the line items represent actual people at your firm – not just abstract percentages in a spreadsheet. Financial modeling is often more complex for JV deals because the revenue and expense sharing, commissions, and payment terms can be quite complicated. With this one, you work with acquired companies to integrate their systems with your company’s, report their financial results, and connect key people to make sure the acquired company performs well. You work to ensure that acquisitions not only happen, but are also successful – the unglamorous parts of deal-making that bankers always skip. Separate teams sometimes handle this task, so you may not do anything in this area at certain companies. This category includes researching industries, doing internal calls and meetings with other team members and divisions, and planning out your firm’s strategy, which includes finding the most promising markets and potential partners. This time split was a bit unusual because he spent relatively little time on sourcing for a company this size. This split is typical for smaller companies – more time is spent on generating deals than on executing them. This reader spent no time on sourcing because it’s unnecessary at a company this size; the executives generate deal flow via their connections, and bankers pitch ideas all the time. The unusual part is that this reader spent the most time on post-deal integration – which many CD teams do not do at all. This one’s a more standard split for a mid-sized company, with roughly equal allocations to the four most common tasks and nothing for integration. He spends a bit less time on sourcing because the company is PE-owned, so the owners may generate more deal flow. From these stories, a few themes emerge. First, you tend to spend more time on sourcing at smaller companies and more time on deal analysis/execution at larger companies. Second, the tasks vary heavily based on company and industry – corporate development at a middle-market company with a 3-person team is a completely different experience from a 20-person team at a Fortune 100 company that executes billion-dollar deals. Not much changes at a private equity-owned company, but sometimes the owners will do more of the financing and sourcing work. The close rate tends to be quite low in corporate development because you need to win approval from each department that’s affected by the deal. Winning consensus at large public companies is like herding cats, and you’ll often encounter risk-averse middle managers who will do anything to preserve their positions. If your group looks seriously at 50-100 deals per year, you might be lucky to close 2-4 of them, and closing 0 deals is 100% plausible. The process is slower not just because of office politics, but also because some companies are not represented by bankers, which tends to make due diligence disorganized and create more last-minute surprises. In emerging markets, you’ll spend more time on “relationship management” and guiding the CEO and CFO through the M&A process. My best advice is that you should carefully research the company’s acquisition and partnership history before accepting a job offer there. If a company has not been acquisitive historically, it’s extremely unlikely to change in the next few years, no matter what it claims. It’s a very different environment from banks and consulting firms, where everyone is ambitious and wants to move up by winning clients and doing deals. Overall, you’ll work far less in corporate development careers than you would in investment banking, private equity, or hedge funds. You might work 45-55 hours in an average week, rising to 60-70 (or more) if a live deal is near the finish line. For context, 60-70 hours would be a slow week in investment banking, and a 45-55-hour week would be a unicorn. No Pressure to Do Deals Constantly – If you don’t close deals in investment banking, you don’t get paid. If you don’t close deals in CD… you still earn your salary. Less Grunt Work – You do not spend time creating 200-slide pitch books because they are completely unnecessary in CD. You do create materials for internal meetings, but they’re shorter and don’t involve the same level of grunt work. Team Structure and Composition – Teams in investment banking skew young because very few people over the age of 40 will work 70-80+ hours per week consistently. By contrast, teams tend to be older in corporate development, and people come from more diverse backgrounds in terms of education and work experience. The culture is more relaxed, though this varies by the firm as well. You should expect that the CD team of a large financial institution or Fortune 100 company will be more formal than the team at a 300-person pre-IPO tech startup, for example. The environment is more social than the average PE or VC firm, where everyone tends to work independently in “lone wolf” mode, but less social than most banks, where junior-level employees sit together and chat in between work. The CD hierarchy at most companies is: Analyst -> Associate -> Manager -> Director -> VP or Head of Corporate Development. There may be variations such as Associate Director vs. Senior Director or Junior vs. Senior Analyst, and some companies may not have Analyst roles at all. At smaller companies, this hierarchy may be compressed into Associate -> Manager -> Director; at larger companies, there may be more levels, such as an EVP or SVP with many responsibilities who also dabbles in corporate development. Even if there’s technically an EVP or SVP at the top, the VP or Head of Corporate Development runs everything, and it’s rare for top executives like the CFO to be involved with day-to-day activities. Advancing up each level of this hierarchy might take several years, so if you start as an Associate out of an IB Analyst role and perform well, you might reach the Director level in 5-7 years. Going beyond that is difficult and time-consuming because turnover is low. Many ex-bankers win corporate development roles and then never want to leave because the hours are manageable, pay is still quite good, and it’s possible to have a family and outside life. And there’s no “up or out” culture as there is in IB, so you could be waiting a very, very, very long time to advance to the top. If you want to advance, it’s almost always better to transfer to a different division at your company and move up there, ideally in a product or marketing role. Corporate development is not an ideal path to C-level roles such as CEO and CFO because the required skill sets are broader and require more leadership/management ability. To become a CFO, you should start in the corporate finance career path in a role such as FP&A or Treasury, and to become a CEO, you’d be better off in sales, product, or starting your own company. It’s difficult to pinpoint salaries and bonuses because they vary widely – and titles sometimes differ between different companies, making exact comparisons difficult. Associate: Base salaries of $100K – $120K and bonuses worth 20-30% of base salary, for total compensation of $120K – $160K. Manager: Base salaries of $140K – $160K and bonuses worth 35-50% of base salary, for total compensation of $190K – $240K. Director: Total compensation of ~$300K – $400K, with a higher percentage from the bonus and stock (over 50%). VP or Head of Corporate Development: Total compensation of $500K+, perhaps approaching $1 million depending on bonuses and stock-based compensation. These may seem like impressive numbers, and they are – but there are also a few caveats. First, compensation at the Director level is about what Associates in investment banking earn, and it only takes 3-4 years to reach the Associate level at a bank (starting as an Analyst out of undergrad) vs. several more years for Director in corporate development. So, the potential is there, but corporate development careers offer slower advancement to the same compensation level. Second, these compensation figures are almost certainly lower outside of major centers like New York and London and at smaller companies. Third, stock-based compensation plays a major role in these figures, so you need to be aware of the type of equity you’re getting, the company’s valuation, and the vesting period for any options you receive. Stock Grants: You receive X shares in the company, which vest over Y years. Stock Options: You receive the rights to purchase X shares in the company for an exercise price of Y, and those rights vest over Z years. Stock Awards: You receive X dollar amount of compensation, the company then uses that dollar figure to purchase Y number of shares on a certain date, and those shares then vest over Z years. Restricted Stock Units (RSUs): These are similar to normal stock grants, but there are restrictions on when you can transfer or sell the stock. Each type of SBC has different tax consequences, and the treatment also differs depending on your country. But the biggest issue is that it’s often difficult to request the relevant information from the company, especially if the company is private and doesn’t want to disclose its “cap table,” which shows the shares, options, and RSUs owned by all employees and investors. If you’re at a large public company, stock-based compensation is much more straightforward and can be added reliably to your salary and bonus for the year. But if you’re at a private company, then you should be very conservative and assume that your equity is worth nothing. If it ends up being worth something, or you hit the jackpot by joining a hot startup before it goes public, great – but don’t assume anything. The first two parts of that statement are true, but that does not mean that it’s easy or particularly common to move from CD into IB or PE. Part of the problem is cultural: yes, you work on deals in CD, but the culture and hours are more laid back, and the key challenges are different. On the PE side, it’s ridiculously competitive to win interviews and offers even if you’re in investment banking at a top bulge-bracket bank – so you can imagine the difficulties if you’re in corporate development at a lesser-known, mid-tier firm. Also, there’s less ownership of deals in CD. You do not monitor the “portfolio” of acquired companies the same way PE firms do, and if a transaction goes wrong, you can just blame it on the incompetent General Manager in some other division. Of these two, it’s easier to get into investment banking from corporate development, especially if you do so earlier (e.g., a year or two out of undergrad if you win a rare entry-level role in CD). If you want to pursue private equity, you’ll probably have to find a firm whose industry focus matches your company’s and time the move perfectly (e.g., apply just as someone has left or after the firm has raised a new fund for a major expansion). Winning public-markets roles, such as in equity research, asset management, or hedge funds would be virtually impossible coming from corporate development because the skill sets and mindsets are too different. Most professionals stay in corporate development careers or move to other divisions at the company, such as corporate finance or specific product groups. In both cases, the usual motivation is faster/better advancement and the possibility of reaching a C-level executive position in the long term. Long-term, singular focus on building a company. Exposure to executives such as Group Heads and the CEO, which can help with transfers and references in the future and even business school. Great work/life balance and good compensation relative to non-finance jobs. Interesting work and relaxed culture. Good opportunity to transfer to other divisions/groups and advance more rapidly there. Can be a good “side door” or “back door” into high finance if you don’t have the traditional background required to get into investment banking. Slow advancement, especially to reach the top levels. Compensation is a big discount to what you earn in IB and PE roles. Small industry with relatively few job openings. More office politics and risk-averse middle management than in IB/PE/HF roles. Less ownership of deals than in fields like PE/VC, and less of a link between your individual contributions and your compensation/advancement. You’re more of a “facilitator” rather than an original idea generator, at least at large companies. So, are corporate development careers right for you? It’s impossible to give a universal answer, but if you understand the trade-offs above, you’ll be able to cut through the online confusion and start framing your personal answer. And if you interview for a corporate development role and run into anyone who reminds you of a Dilbert character, cut your losses and run the other way. In terms of the exit opportunities, Is CD experience usually discounted for IB? Yes, it’s discounted a bit because bankers perceive anything outside IB/PE to be “lesser.” But the skill set is still very relevant, so CD professionals often do get into IB. If you want to aim for PE roles directly, yes, you need to practice with modeling tests, forming investment theses, taking strong views on deals, etc., but the main problem is networking and gaining access because PE recruiting is extremely heavily slanted toward students who attended top universities and worked at the top banks. You will probably have to spend 90% of your time networking and 10% of your time preparing to have a good shot. That means looking for smaller/newer funds, finding professionals at them on LinkedIn, and being very aggressive with your outreach. Recruiters won’t be super useful here unless you happen to find one who’s looking for CD professionals.